Catopsis floribunda, or many-flowered catopsis. 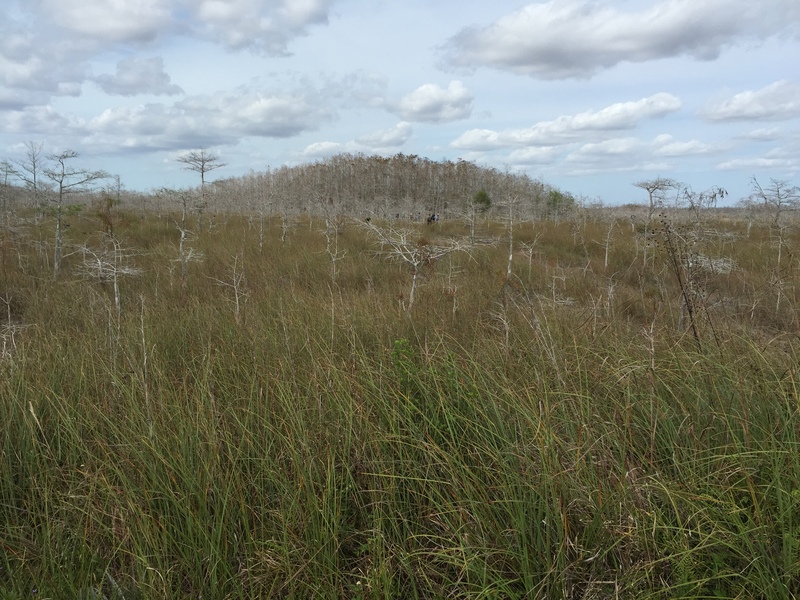 This past couple of weekends I’ve had the opportunity to spend time in the Florida Everglades, specifically the Everglades National Park. Thanks to a friend who was accepted as the Artist in Residence of the park for a brief while, she provided my partner and I with all the reason we would have needed to go. To quote a popular phrase from Mikhail Gorbachev, “To me, nature is sacred. Trees are my temples and forests are my cathedrals.” My local UU congregation provides me with a community of like minded people, but the opportunity to be out in nature provides me with the opportunity to commune with the divine. So while I miss some of the faces that I haven’t seen these past couple of Sundays, I think they’ll understand and forgive my recent absence. 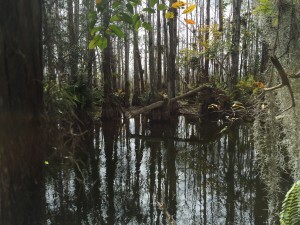 Pond at the center of the cypress dome. At Imbolc, I experienced a wonderful, joyful reunion with the rekindled flame of spirit… I wouldn’t exactly call it the birth of spring, after all, even in winter things are always green here. But it was that sense of dormancy being sloughed off. Brighid, my patron goddess, was powerfully all around and active within my ritual. There was, however, a feeling that she conveyed in the ritual that while life is being renewed, the birth might not be an easy one. The message was transformation but with a distinct possibility that it could be painful. The next weekend I stood in total darkness on the Gumbo Limbo Trail. 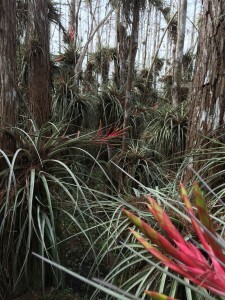 It’s an easy, paved trail that wanders through a hammock of gumbo limbo trees. In Florida some folks call them tourist trees because their bark peels away, revealing a reddish wood beneath, reminiscent of the sunburnt skin of people who aren’t used to the intensity of the sun here. My partner and our friend meandered along, our eyes adjusting to be able to see outlines. The moon occasionally snuck through the canopy, laying down a patch of metallic light before being consumed by dense foliage once again. This was the first place in all of my years in Florida that I have seen fireflies. I thought of them as will-o-wisps, entranced by their slow dance and hypnotic yellow lights. In that space it became easy to understand, in the darkness, how one could absently follow them into boggy places, which were everywhere. I can’t explain it, but I started to feel a bit light-headed then, just briefly. 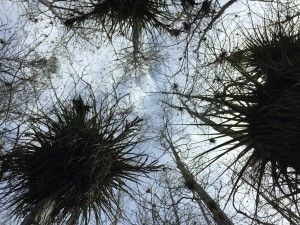 It was as if all of the life of the hammock and the surrounding grassy swamps weighed down upon me, just for a moment. It was a mixture of awe and brushing up against a primitive power. There was a presence there, a unique identity, and I was experiencing it, but for now, only just. The following weekend we returned. Friday night we had a little party and I went to bed feeling tipsy but not over the line. In the morning, after a quick cup of coffee, we rushed out to catch sunrise at another trail. It struggled through some low clouds on the horizon, but eventually emerged, turning the sporadic low clouds that were drifting like ships overhead a blueish purple. From an elevated place, one can spin around 360 degrees and see for miles and miles, all the way to the horizon, with virtually no evidence of humans being around. The weight of place, it’s presence was there again. I fought with dizziness but it was only compounded on our car ride back by the motion sickness I get when I ride in the back seat. A cypress dome viewed from our point of entry. We were to meet a group of a dozen or so people back at our friend’s temporary lodging for a hike but the way things were going for my equilibrium, it wasn’t looking promising. Once the car was in park, I leapt out and stumbled around for a minute before vomiting. Surprisingly, that seemed to help, and after a little walk around and some fresh air, I was feeling much better. About an hour later, with a group of a dozen or so, we ventured off the main access road, just past the Pahayokee overlook towards a cypress dome. Cypress domes are these amazing features where a single cypress tree finds a depression in the limestone that’s lower than the surrounding area. Other cypress grow around this area, with the center having the highest trees while those on the edges are the shortest. 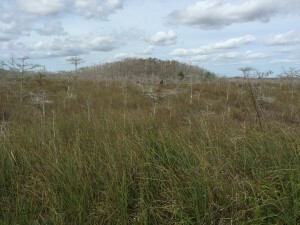 This being dry season, we slogged through sawgrass that sat in mud that went anywhere from a few inches deep to hip high (one unfortunate woman in our group proved this). Although the landscape was very open, it seemed like we were being tightly squeezed through a single access point. When we made it into the dome, it was stunning. Cypress with white bark towered above; looking up towards the treetops, I got a slight sense of vertigo. Cypress trees towering above, looking up from the center of the dome. Venturing more deeply, a pond was at the center. 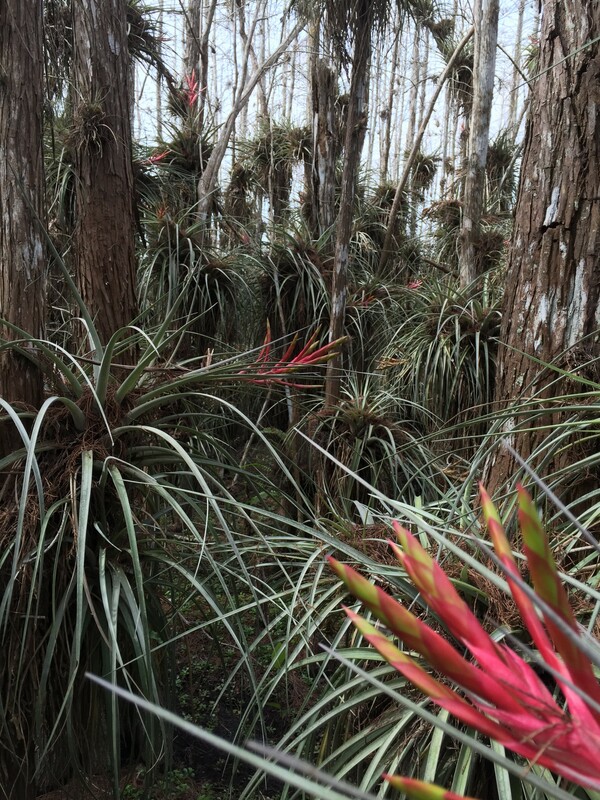 In the deepest layers, Catopsis floribunda, or many-flowered catopsis clung to the trees, along with bromeliads, making it feel like a very thick, lush jungle. A hush fell over the group as we all wandered around, in awe. The spirit of this place was subdued but active. I felt like I was in someone’s house and quietly gave a little thanks for the opportunity and sense of welcome. Through the pain and unease, I came out the other side, and though it was uncomfortable, I began to understand… this was like standing in the presence of a god. This sense of overwhelm, of dizziness, of panic on this trip was actually my spirit brushing against the immensity of this place and, perhaps, reacting appropriately. I feel like this and the experience that I wrote about in my previous blog post, “Dancing with Cernunnos” are the continuation of this theme. Of my ongoing quest to more deeply appreciate the wild spirit of this place. The experience has been challenging, painful and invigorating. Indeed, on these trips, I was hiking with an ankle brace because I still am recovering from my fractured ankle from my first ‘dance’. I think I’m seeking a certain kind of communion, in my becoming a patron, my experience may be a little extreme. If you vacation in Florida, I promise, these areas are the best part. 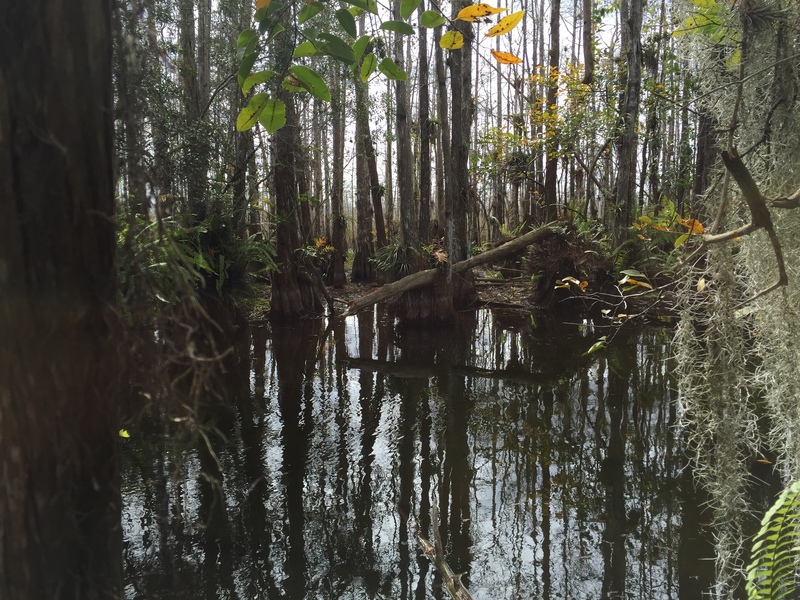 Skip that mutant rat up in Orlando and get your feet wet and muddy. Wild Florida needs more people who are deeply in love with it.